AT LAST, THE PRECIOUS IS MINE. My boyf encouraged me not to open it until Cyber Monday, in case it was discounted even further. I was distraught at first at the thought of not being able to open my precious, but he made good sense, so I agreed. Cyber Monday came and went, there was no additional discount, and so the Reader was opened with much fanfare and joy. Oh, and more squeeing, too. My first purchased ebooks were Girl at Sea and Scarlett Fever by Mauren Johnson. (I'm on a Maureen Johnson kick lately, what can I say). And now I want to hear from you -- which ebooks should I download? Give me your recs in the comments! Congrats on your e-reader! 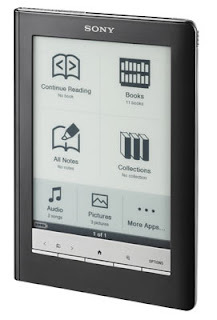 I love my Kindle, but you can add free e-books to it. I just check them out on my computer and load them to my Kindle. Let us know what your first ebook will be! Woot! So happy for you! Are you doing NaNoWriMo, too? A Lolcat and a Question.